Journal Reference: Morrison H and J Peters. 2018. "Theoretical expressions for the ascent rate of moist deep convective thermals." Journal of the Atmospheric Sciences, 75(5), 10.1175/JAS-D-17-0295.1. Conceptual model of a rising moist convective thermal. Colored arrows on the left indicate buoyant forcing (orange), buoyant pressure forcing (green), and dynamic pressure forcing (blue). The purple line to the right shows a prototypical vertical air velocity profile (relative to the ground). w*t and w*b indicate the vertical velocity at the thermal top and bottom, respectively, and w*m the maximum vertical velocity which typically occurs near the thermal center. Comparison of numerically simulated (y axis) and theoretical (x axis) ratios of the thermal ascent rate and maximum vertical velocity within the thermal. 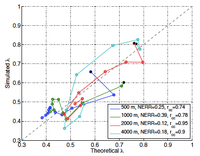 Different colored lines show results for different initial thermal sizes as indicated. NERR and rcc are the normalized error and linear correlation coefficient, respectively. The dashed line indicates a 1:1 correspondence between the theoretical and numerical values. Recent observations and detailed, high-resolution numerical modeling studies have indicated the thermal-like, bubbling nature of moist convection. Using theoretical insights and high-resolution numerical modeling, researchers at the National Center for Atmospheric Research and the Naval Postgraduate School developed a mathematical expression for the ascent rate of these thermals comprising convective clouds, as well as the drag that they experience as they ascend through the troposphere. The ascent rate of moist thermals is critical because it controls, in part, the vertical fluxes of air, water, and chemical constituents that individual thermals carry. The mathematical expressions for moist convective thermal ascent rate and drag could be used in weather and climate models to improve their representation of cumulus convection. Moist convection is a critical component of the atmosphere. It produces a large fraction of the precipitation that falls to Earth, and the anvil clouds associated with deep convection trap longwave radiation, acting as a thermal blanket. Despite being a focus of research for the past several decades, some features of moist convective dynamics remain uncertain. For example, there has been considerable debate on whether the structure of convective updrafts is more like a plume – a chimney of cloudy buoyant air – or like a thermal – a rising bubble of cloudy buoyant air. Recent observations and detailed, high-resolution numerical modeling studies have indicated the thermal-like, bubbling nature of moist convection. Individual thermals in these convective clouds have the structure of a spherical vortex, with ascent at the center and descent around the edges, relative to the ascent of the bubble as a whole. This structure is similar to a simple mathematical model called Hill’s vortex, named after 19th and early 20th century English mathematician Micaiah John Muller Hill. However, real moist convective thermals in the atmosphere have some key differences compared to Hill’s vortex. For example, Hill’s vortex has no drag and is non-buoyant, unlike moist thermals. 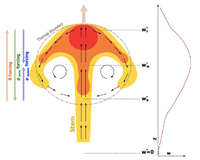 These differences have hindered a simple mathematical description of moist thermal behavior. Using theoretical insights and high-resolution numerical modeling, researchers at the National Center for Atmospheric Research and the Naval Postgraduate School developed a simple mathematical relationship for the ascent rate of moist convective thermals as a function of their buoyancy structure. The ascent rate of moist thermals is critical because it controls, in part, the vertical flux of air, water, and chemical constituents that they carry. It was found that the ascent rate of a thermal, relative to the maximum upward velocity of air within it, generally decreases as thermals ascend upward through the atmosphere. Thus, their internal circulation tends to strengthen as they ascend. The buoyancy within thermals also induces a vertical asymmetry in the flow which is associated with considerable drag, unlike Hill’s vortex. 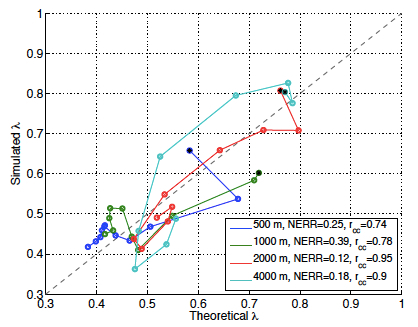 Results suggest relatively large drag in the lower atmosphere, with a decreasing drag coefficient as thermals ascend, that is primarily associated with vertical asymmetry in the thermal flow field. 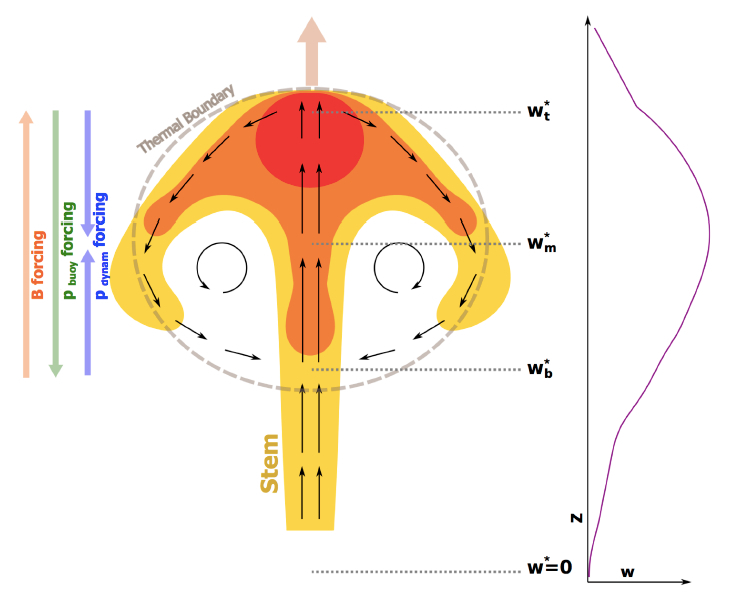 Overall this work could be used to improve existing convection parameterizations in weather and climate models, or as a basis for developing new thermal-based convection schemes.